The Mars InSight spacecraft, set to launch this weekend, will also take the planet's pulse by making the first measurements of "marsquakes." And to check its reflexes, scientists will track the wobbly rotation of Mars on its axis to better understand the size and makeup of its core. The lander's instruments will allow scientists "to stare down deep into the planet," said the mission's chief scientist, Bruce Banerdt of NASA's Jet Propulsion Laboratory. "Beauty's not just skin deep here," he said. The $1 billion U.S.-European mission is the first dedicated to studying the innards of Mars. By probing Mars' insides, scientists hope to better understand how the red planet — any rocky planet, including our own— formed 4.5 billion years ago. Mars is smaller and geologically less active than its neighbor Earth, where plate tectonics and other processes have obscured our planet's original makeup. As a result, Mars has retained the "fingerprints" of early evolution, said Banerdt. In another first for the mission, a pair of briefcase-size satellites will launch aboard InSight, break free after liftoff, then follow the spacecraft for six months all the way to Mars. They won't stop at Mars, just fly past. The point is to test the two CubeSats as a potential communication link with InSight as it descends to the red planet on Nov. 26. These Mars-bound cubes are nicknamed WALL-E and EVE after the animated movie characters. That's because they're equipped with the same type of propulsion used in fire extinguishers to expel foam. In the 2008 movie, WALL-E used a fire extinguisher to propel through space. No matter the launching point, getting to Mars is hard. Astronauts aboard the International Space Station tested a fidget spinner in zero gravity. They had time to play with the popular toy in between three scheduled space walks this month. The success rate, counting orbiters and landers by NASA and others, is only about 40 percent. The U.S. is the only country to have successfully landed and operated spacecraft on Mars. The 1976 Vikings were the first landing successes. The most recent was the 2012 Curiosity rover. InSight will use the same type of straightforward parachute deployment and engine firings during descent as Phoenix lander did in 2008. No bouncy air bags like the Spirit and Opportunity rovers in 2004. No sky crane drop like Curiosity. Landing on Mars with a spacecraft that's not much bigger than a couple of office desks is "a hugely difficult task, and every time we do it, we're on pins and needles," Banerdt said. 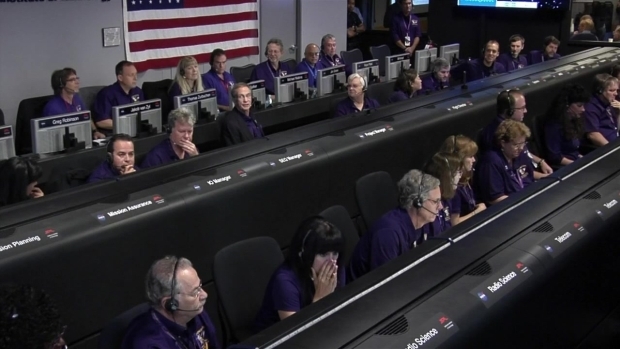 It will take seven minutes for the spacecraft's entry, descent and landing. "Hopefully, we won't get any surprises on our landing day. 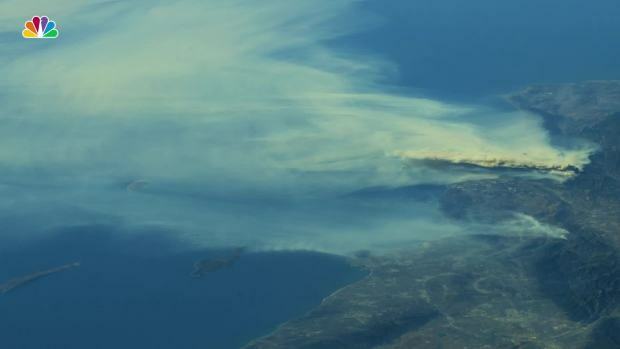 But you never know," said NASA project manager Tom Hoffman. 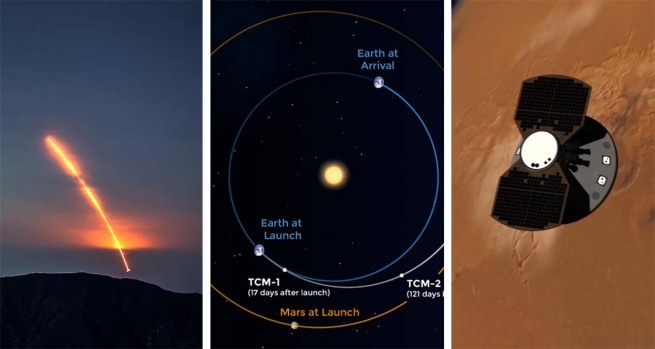 Once on the surface, InSight will take interplanetary excavation to a "whole new level," according to NASA's science mission director Thomas Zurbuchen. A slender cylindrical probe dubbed the mole is designed to tunnel nearly 16 feet (5 meters) into the Martian soil. A quake-measuring seismometer, meanwhile, will be removed from the lander by a mechanical arm and placed directly on the surface for better vibration monitoring. InSight is actually two years late flying because of problems with the French-supplied seismometer system that had to be fixed. 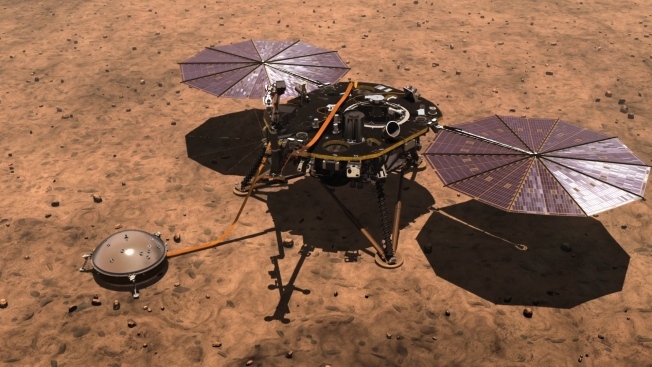 The 1,530-pound (694-kilogram) InSight builds on the design of the Phoenix lander and, before that, the Viking landers. They're all stationary three-legged landers; no roaming around. InSight stands for "Interior Exploration using Seismic Investigations, Geodesy and Heat Transport." InSight's science objectives, however, are reminiscent of NASA's Apollo program. Back in the late 1960s and early 1970s, the Apollo moonwalkers drilled up to 8 feet (2.5 meters) into the lunar surface so scientists back home could measure the underground flow of lunar heat. The moon still holds seismometers left behind by the 12 moonmen. Previous Mars missions have focused on surface or close-to-the-surface rocks and mineral. Phoenix, for instance, dug just several inches down for samples. The Martian atmosphere and magnetic field also have been examined in detail over the decades. "But we have never probed sort of beneath the outermost skin of the planet," said Banerdt. The landing site, Elysium Planitia, is a flat equatorial region with few big rocks that could damage the spacecraft on touchdown or block the mechanical mole's drilling. Banerdt jokingly calls it "the biggest parking lot on Mars." Scientists are shooting for two years of work — that's two years by Earth standards, or the equivalent of one full Martian year. "Mars is still a pretty mysterious planet," Banerdt said. "Even with all the studying that we've done, it could throw us a curveball."